Even before the designer morph craze, ball pythons were a very popular choice when selecting a pet snake. Many people will agree that, across the years, the two most popular snakes to choose as pets have been ball pythons and corn snakes. Their relatively small size and generally casual demeanor make them great choices for people who love snakes but aren’t down with wondering if they are about to get chewed on every time they open the enclosure. When coupled with the staggering number of color and pattern variations (from both species) it’s easy to see why they are eternal staples of the reptile world. But despite all of the wonderful qualities that make ball pythons a great choice there is one quality that keepers will inevitably lament: the ball python appetite. The feeding response of ball pythons can be nothing short of a mystifying source of frustration. Most ball pythons are great eaters but even the best of them can do an appetite-180, leaving you scratching your head, wondering what happened to their desire to feed. One thing is true: live with ball pythons long enough and you will eventually have one that decides to take a rodent swallowing hiatus. And few snakes can rival the stubbornness of the ball python when it comes to these hunger strikes. But why? What makes ball pythons stop feeding and how do we get them to start again? Better still, is it possible to get them to not stop feeding in the first place? It would be nice to say that ball pythons are as gluttonous as Burmese Pythons or as ravenous as kingsnakes but they aren’t. Many experienced ball python keepers will agree that the on-again-off-again feeding behavior is “just part of keeping ball pythons”. I wish this statement lacked merit but in my experience it, unfortunately, does not. Ball pythons can and do stop feeding for sometimes prolonged periods of time without an immediately discernible reason. This statement is true for even the best reptile keepers. But a feeding hiatus is not always an irreconcilable span of time through which you must endure; there are often subtle causes that, once corrected, can get your snake back on food. This is because ball python feeding is not purely formulaic or mechanical. Unlike some snakes that will eat anywhere, anytime, ball pythons need to be offered food in a way that works for them. This means that the mechanics of snake feeding (i.e. open enclosure, insert food, close enclosure) may also require a bit of artistry on your behalf. Let’s explore. Ball pythons (like all snakes) have individual personalities and unique dispositions. No, they do not have the personality of a dog, but they have a certain charm that is unique and unmistakable. People who have read this far already know this. Ball pythons have varying levels of self-confidence. Some ball pythons, even hatchlings, think they can take you down while others are scared of a hopper mouse. Through the years it has been my experience that ball python dispositions are present at birth and don’t tend to change much with age. Ball pythons with a ‘flighty’ or fearful disposition tend be be less strong feeders. Keep in mind that the onset of fear is usually situational. Almost all pythons in uncomfortable surroundings will be fearful. But some ball pythons are fearful even when kept in idyllic environments. A ball pythons reaction to fear is more likely to be “flight” than “fight”. There are always exceptions, of course. Ball pythons can differentiate people. I don’t really know whether this recognition is sight or scent-based (I suspect both) but I can assure you that my ball pythons know the difference between me and other people. I don’t anthropomorphize though. The distinction is more of a “that is a threat” or “that is not as much of a threat” thing. Or perhaps, “he wants to eat me” vs. “he probably does not want to eat me”. You can name, love, kiss and snuggle your ball python all you want but the most you should ever really hope for is for him/her to put you in the “does not want to eat me” category. This is a close as your ball python is ever going to come to loving you. Don’t feel bad, though. Trusting you to not eat him/her is a big leap for an animal that hovers somewhere in the middle of the food chain. This is particularly true considering the fact the trust is being given to the apex predator (i.e. you). Ball pythons can have different ‘taste’ preferences. Rats, mice, African Soft-Furred (ASF). Live, fresh killed and frozen/thawed (F/T). While some snakes seem to be willing to eat anything there are others that are quite picky about the what, when, where and how of a meal. For example, I can offer a ball python a fuzzy rat and it will completely ignore it. I can leave that fuzzy rat in the enclosure and offer a live mouse and the snake will take it instantly. More than a few times I have watched a ball python crawl over a fuzzy rat on their way to get a mouse. And you will also encounter the opposite; a snake who won’t take mice but will gladly readily take rats. If your snake is picky about type of rodent it will be up to you to figure out exactly what he/she wants. Keep in mind that the type of food offered is only one factor in the equation. A lot of people struggling to get their ball python back on food only consider the type of food offered. There are other factors. Ball pythons can have a food size preference. Some ball pythons will only eat meals that are impossibly small compared to what they could take. Others are just the opposite; some ball pythons seem to like the challenge of a rodent that pushes their limits. The overwhelming majority, fortunately, take appropriately sized prey. It is not unusual for a snake to ignore or avoid a rodent that is too large or too small while waiting, like Goldilocks, for the size that is just right. This is easy to deal with if you breed your own rodents but is a bit problematic if you are getting rodents one at a time from the pet store. If you watch closely you may see your ball python “sizing up” the food you offer. Their brains quickly work through some set of equations that let them know whether or not it’s go-time on a rodent. There is no way to know, other than through trial and error, what size rodent your ball python is willing to take. If your ball python gets bit you may need to settle in for a feeding outage. If you feed live food to your snakes it is inevitable that it will get bit by the rodent during the process. Sometimes they just don’t get them wrapped up quite right and the rodent will sink its teeth into your snake. I’ll wager that 99.9% of the time the bite doesn’t break the skin and your snake will show no signs of the rodent’s final efforts. But every now and then (the other 0.01%) a rodent will get the elusive angle correct and the result is an actual wound on your snake. If it is bad enough I have seen snakes who were once great feeders become trigger shy for a lengthy period of time. They seem to remember that the last time they ate they came out of it with some battle damage and the hurt they felt is a vibrant enough memory to make them reluctant to have another go at it. How long a bite-initiated feeding hiatus will last is incredibly variable but I have found that one of the best ways to get them going again is to offer much smaller food. It has to be big enough for them to wrap around but should be a good bit smaller than what their normal fare would be. You can mitigate the damage of a bite by chaperoning the feeding process (which I always recommend). I usually keep a pencil or a set of forceps/tweezers handy in case the rat does sink its teeth into the snake. When I see it happen I calmly put the tip of the (unsharpened) pencil or tweezers into the rodent’s mouth. It will immediately start chewing on it rather than the snake. It is a very effective way of making sure a bite injury is minimized or eliminated. C) odd as it may be, rodents fall from the sky (those of you who notice how your ball python looks up when you open the enclosure can appreciate this). If you snake is giving you The Look you should be prepared to feed it (Note: The picture seen later in this article is a textbook example of The Look). I almost never let The Look go unanswered. You can leverage The Look to get your snake to take a rodent they might normally ignore. If you drop a rat into the tub in such a way that it will walk straight to the nose of the snake (walk, not run) it is an almost surefire way to get the snake to strike and wrap, even if the food is not a type it normally prefers. This is often a one shot opportunity; if you do not drop the rat in just right the snake will be removed from it’s ‘feeding zone’ and will often not take the rat as it roams about the enclosure. I have a few snakes that prefer mice but I can often get them to take rats using this technique. If the rat roams the cage they won’t take it but if the rats falls from heaven just in front of them and walks directly toward their nose they will frequently strike and wrap first and wonder what they ate later. The ball python appetite is linked to its environment. This is incredibly important and often overlooked. If the environment is wrong, even the hungriest of ball pythons is unlikely to eat. Ball pythons will not conform to a one-size-fits-all approach. Don’t think that your snake will adapt to the way you want to keep and feed it. You will find success faster if you acknowledge that it’s the other way around. Ball pythons, I have found, are much more patient that I am. To your amazement your finicky ball python will begin to eat like crazy, even going so far as to shoot out of the cage whenever you open it even a little bit. And then, one day, it will return to its normal finicky demeanor. Sick ball pythons rarely eat. If your snake is not healthy none of the discussion in this article will help you. Good husbandry greatly reduces the likelihood that a snake will become sick. Over the past 20+ years I have dealt with more ball python feeding issues than I can count. And despite my experience with the species I continue to deal with them today. Assuming I’m not a bad keeper, this gives a lot of credence to the argument that temperamental feeding is part of keeping ball pythons. Neither I nor anyone else has deciphered a magic formula that makes ball pythons eat like kingsnakes. Like any experienced parent I have learned to roll with things over which newer keepers tend to fret. A healthy ball python that stops eating for a few months hardly even registers on my worry-meter. My annoyance levels may be off the chart but I know it’s nothing to worry about. When I offer my snakes food it is not unusual for several of them to refuse. But on a different day the majority of them will eat. My wife can tell how well feeding went by my demeanor when I get home at the end of feeding day. If I’m happy and upbeat she knows that snake appetites were good that day. If I’m short-tempered and grouchy she knows that a lot of rodents got put back into a holding tub at the end of the day. Interestingly enough (read that as ‘Frustratingly enough’) several of the things that seem to make ball pythons stop feeding will also make them start again. It is never a given nor is it a simple formula for success. The logic of ‘IF a, THEN b‘ doesn’t always apply. It’s more like, ‘IF a, then b. But if b doesn’t work, try c. Or maybe b and c.’ This means there is no one specific way to respond to a non-feeding snake. But I am often able to find success through trying multiple different approaches. Many are successful, but not always. Every snake is different. By way of example I would like to discuss several of the items listed above. To do this I want to share a few anecdotal stories that illustrate the apparent randomness of a ball python’s feeding response and follow with a discussion on why I feel the snake was/was not feeding. Several years ago while at at a fellow breeder’s facility I was shown a tub that had a 1,200 gram female clown in it. My friend proceeded to tell me how much he hated this snake because it would not eat. The snake had been in his collection for a full year and had not taken a meal (Note: a healthy adult ball python not eating for a year does not surprise me. Annoy? Yes. Surprise? No. I have seen it several times over the years). The previous owner (who was worthy of trust) had reported no problems getting the snake to feed (it didn’t get to 1,200 grams by not eating). Exasperated, he told me to take it and see if I could get it to eat. After working out a deal that made both of us feel good the snake was bagged up and driven across town to my facility. I set it up the way I do all of my animals and about twenty minutes later it took a small live rat. And then it took another. And then another. After having refused food for a full year it took three rats as soon as it got to a new place. And it didn’t stop there; the snake ate 10 rats in the following three weeks. That snake, which is still with me today, remains a solid feeder (although it does occasionally stop feeding for a month or two). Why? Over the years here is what I have found to be generally true: Ball pythons kept on paper do well on paper. If you move a ball python from paper to cypress mulch it typically continues to feed well (or better). If you move a ball python from cypress mulch to paper they frequently stop feeding. How long they stop feeding has been highly variable in my experience but a hiatus in excess of 4-6 months would not surprise me. The same is true for moving snakes from aspen bedding to paper (or cypress mulch to aspen). Every breeder has their favorite but I am a firm believer in the value of cypress mulch for creating an environment conducive to ball python feeding. It holds moisture well, resists mold and absorbs waste. It is fairly inexpensive (but far from free), easy to spot clean and is aesthetically pleasing. The down-side of mulch is that it is more expensive than using old newspapers collected from your neighbors recycle bins. It is also dusty when it dries out (but not as dusty as aspen bedding). The substrate question is a very important one especially when coupled with the size of the animal when you acquire it. Hatchling or well-started babies will almost always readily feed when moved from one location to another (or from one substrate to another). The same is not true for subadult or adult animals. By far the most common feeding issues are not with baby ball pythons; they are with subadult and adult animals. When you buy an animals that is kept on aspen or cypress and decide to move it to paper you need to be prepared for the very real chance that a hunger strike is in your future. Your best chance for success when acquiring animals of larger size is to replicate, as much as possible, the conditions in which they were kept with the breeder. Moving a larger animals to a bigger enclosure and/or changing the substrate is an almost sure-fire way to get them to stop feeding. Please keep in mind that bigger also includes the transparency of the enclosure. A non-translucent grey tub with dimensions of AxBxC is NOT the same as a translucent version of the same tub. Ball pythons do not like a lot of light and translucent/clear tubs afford them no protection from the perceived exposure of excessive light. A few months ago I moved an enchi orange dream female from a hatchling baby rack to a medium-sized grow-up rack. And when I did she immediately quit eating. After two months of trying to get her to eat I moved her back to the baby rack. She at a live rat about 20 minutes after I moved her back to the small rack. Why? #2 Why (Enchi Orange Dream) – Two reasons: Enclosure size and enclosure change. You will find near-unanimous agreement from experienced ball python breeders that moving a snake from a small enclosure to a larger one comes with a very high degree of likelihood that a feeding hiatus is imminent. For reasons I do not fully understand ball pythons stop feeding when moved to a larger cage. This is especially true when the snake already has some size. Hatchlings seem to do better than sub-adults or adults when moved to larger enclosures. Once moved the feeding strike can last for highly variable amounts of time. Moving them back to a smaller enclosure will often end the strike and feeding will resume. Overall, I attribute the stoppage to feelings of insecurity. Ball pythons feel more secure in small spaces and the move to a larger space leaves them feeling exposed and unsafe. Snakes that do not feel safe do not eat. A few years ago I hatched out a pair of pastel genetic stripes. They came from the same clutch and were set up right next to each other on the rack. And from the start both were mediocre feeders. They ate once for every 2-3 meals of the other, unrelated snakes around them. Since they were both poor feeders I very much wanted to blame it on ‘bad genetics’ but both parents have consistently voracious appetites. After a few months of randomly taking meals I moved one of them to a different type of enclosure. The snake that was moved to the new enclosure is now about 3-4X the size of her sister. Ever since the day I moved her to a new enclosure she has been shooting out of the tub, striking at the first sign of movement. Her appetite is amazing and she is now a joy to feed. Here sister, who remained in the original rack still lags way behind. Why? #3 Why (The Pastel Genetic Stripes) – In a word: safety. Normally I will tell you that a bigger enclosure will lead to a temporary feeding break but the ARS 50-series tub, made by ARS Caging, has a built-in divider that turns the whole back part of the tub into a hide. A small opening on one side creates a simulated burrow hole in the back and almost every ball python I have responds incredibly well to it. The natural sense of safety the snake has is unmistakeable and almost immediately noticeable. They sit with their body safely hidden in the hide and their head poking out of the hole, hunting (see picture). This list of snakes that had dramatic (positive) changes in feeding when I put them in this rack with this tub is not to be discounted. As far as I’m concerned this is the single best tub on the market for keeping ball pythons. And no, ARS Caging didn’t ask me to endorse them. The snake that was not moved into this tub is the one that still lags behind. Almost a decade ago I bought a het pied female. From day one the snake was a terrible feeder. She has always been flighty and quick to bite (a decidedly non-ball python characteristic). She ate only occasionally and only took food items that were comparatively small. As recently as 2011 she went the entire year having only taken two (2) rats. To say that I was over her was an understatement. I would have sent her packing but I couldn’t pass such an animal off to somebody else; doing so violates my personal ethics and it’s not good business. And so the years went by with her taking up valuable rack space. And then one day I moved her to a new type of enclosure. Same building. Same temperature. Same substrate. Same everything except the size and type of enclosure. And now she easily falls into the ‘solid feeder’ category. It was pretty much Story #1 above all over again except this time the animal didn’t go into the hands of someone else, it just moved across the room. Why? #4 Why (The Het Pied) – Once again, safety. Ball pythons that bite don’t do so out of aggression or anger. They do so out of fear. This particular snake is, for reasons unknown, very fearful. She has always been that way. Because she is always afraid she is unable to feed with any consistency. When I finally found an enclosure that helped her to feel safe she began feeding consistently and aggressively. The tub, the same ARS 50-series tub referenced above, was the fourth tub size I had tried her in over the years (Sterilite 32 qt, Sterilite 32 qt blacked out front, CF-750, & ARS 70-series were the others). The ARS 50-series tub with the built-in divider helped her feel safe. Once safe, she fed. Several years ago I sold an ivory ball python at a trade show. A few weeks later I got a call asking for help getting the snake to eat. We talked through many options and things to try. Advice was given and husbandy specifics were relayed. The owner insisted that his husbandry was excellent and that his collection was mite-free. A few months went by with no positive results; the snake remained unwilling to eat. The snake had been an excellent feeder while it was with me. This is a frustrating situation for everyone involved. Stress levels are high for the buyer because the snake won’t eat. Tensions are equally high for me because I only sell healthy animals that are feeding well and it frustrates me when a snake does not immediately settle in to things at their new home. Going against all of my operating guidelines I offered to temporarily take the snake back to see if I could get it to eat (Note: this experience cured me of ever doing this again). The snake was brought to me at a trade show and it was immediately noticed that it had acquired mites while in the new owner’s collection (my collection was and is completely mite-free). I resisted the desire to inquire how someone fails to notice little black bugs on a solid white snake. The snake was treated for mites (in an off-site location) and was then brought to the quarantine area in my facility. I set the snake up the same way it was set up when it was originally with me and two hours later it ate a rat. I forwarded pictures and video to the owner. In the remaining days that the snake was with me it continued to feed well. Why? #5 Why (The Ivory) – Put simply: husbandry. Snake mites are the bane of any reptile keeper’s collection. While some breeders consider them to be something that need only be managed I consider them something that simply must not exist in a collection at all. Being infested with snake mites is almost certainly uncomfortable, especially if it is a new sensation. Getting rid of snake mites, while not always the solution, is a must for your snake to have any real chance at behaving in a way you want. Please don’t misunderstand me: snakes that have mites can and do feed but it never surprises me to learn that a snake recently infested with mites has quit feeding. The other reason why this snake didn’t feed could have been related to enclosure size and substrate. After being shown that his snake had mites the new owner admitted he had acquired too many snakes too fast and failed to implement good husbandry techniques (including quarantine). The frustrating part is that the owner insisted to me that his husbandry was excellent prior to bringing the snake back. Stories such as this are a big reason why breeders are frequently unwilling to get involved once the snake is in the new owner’s hands. I have never met a snake keeper who claimed to be a poor one; everybody I talk to testifies with passion as to the quality of their husbandry. The truth is that, while I’m sure that you (wink) are an excellent keeper, many others are not. It is impossible, especially when everybody trumpets their snake-keeping prowess, for a seller to truly know the conditions in which a snake is kept when it leaves their facility. Jaded by a long history of inaccuracies some keepers have adopted a pretty hard-core stance with buyers. The need to balance ‘service after the sale’ with not being taken advantage of by less than stellar keepers is something all breeders must manage. Many years ago a friend of mine acquired a freshly imported ball python. I was there when the crate arrived from Africa and helped him pick the snake from those available. He took it home where it proceeded to not eat for an entire year. After a year went by he sold the snake to me where it came to my facility and proceeded to not eat for another year. After two full years without a meal (yes, 24 months without a meal) I was convinced the snake was going to die. Nevertheless I continued to offer it rats. And one day I placed a rat in its tub and returned to find it gone. After searching my building for the rat I returned to the tub to notice that the snake’s belly was definitely filled with a rat. The next day it ate another rat. A week later it ate two more. From that point on it was a solid feeder. I have never had another snake go this long without feeding and my previous record was a mere 14 months for a wild-caught ball python. If I had not personally witnessed that snake go two years without a meal I would be reluctant to believe it. Freshly imported ball pythons are notoriously finicky feeders. Why? #6 Why (The Wild-Caught Import) – Wild-caught adult and sub-adult ball pythons are in a class of their own when it comes to feeding. While exceptions can and do occur it is pretty much a foregone conclusion that you are going to have feeding challenges with freshly imported animals. The reasons why they do not feed seem to be most commonly associated with food type. Normal rats and mice are often not seen as food by the snake. Many people feel this is scent-based. Some keepers have success getting them to feed with African Soft-Furred mice (ASF’s) but these can be expensive to buy or difficult to find. Even if they do take ASF’s the end goal for most is to get them switched over to ‘regular’ rats. This can take some time. In most cases it takes weeks or months but in extreme cases it can take a year or more. If you don’t want to deal with animals that are statistically more likely to be difficult feeders, stay away from freshly imported adult/sub-adult animals. Long-term captive animals are an exception to this. Once a ball python has been assimilated and begins to feed regularly they are no different than a captive bred animal. I have a breeder spider female that I raised from a hatchling. She is about 7 years old as of today and, despite eating rats early in life, has been an unwavering mouse feeder her entire adult life. Feeding mice to big females is a chore. They need to eat them like peanut M&M’s in order to get the same nutritional volume they would get from a single medium rat. For this reason, many ball python breeders avoid snakes that prefer mice. Across the years I kept my spider in tubs of varying sizes (and from varying cage makers). None of them seemed to have an impact on what she was willing to eat. Every now and they I could trick her into taking a rat (using the technique mentioned at the beginning of this article) but for the most part she was solidly on mice. About a year ago I moved her to a new enclosure; one that is different from any she has been in before. Since then she has been a solid rat feeder! Why? #7 Why (The Spider) – Safety. I don’t normally associate food choice with cage size but this case showed me that stranger things can and do happen. For this particular snake it seems that the size of a rat was a source of intimidation. It didn’t feel as safe as it needed to in the larger enclosure and seemed to lack the necessary confidence to take anything larger than an adult mouse. Because I never offered her big crawler rats (about the same size as an adult mouse) I can’t be 100% sure that this was the case but the snake’s willingness to take a rat once it was in a smaller enclosure with a hide indicates that it needed a confidence boost. More than anything this situation emphasizes my ‘smaller is better’ mantra when discussing ball python enclosures. Several years ago I sold an adult male Sterling to a friend on the West Coast. While with me the snake was a great feeder on live rats. Several weeks later, during one of our regular phone conversations, I asked how the snake was doing. My friend said it had still not taken a meal. We talked about how it was set up and I recommended one change. The snake ate a few minutes after the change was made. Why? #8 Why (The Transcontinental Sterling) – Substrate. This snake was kept on cypress mulch while with me and it ate consistently and well. My friend set it up on sani-chip and it refused to eat. Once the substrate was switched the snake ate. I used to have a male spinner blast that would eat very well from October through January. In February it would stop feeding and would not take another meal until the following September/October. Why? #9 Why (The Spinner Blast) – Every ball python is different. This snake has been on the same feeding cycle for years. When the breeding season begins males tend to get into breeding mode and they frequently don’t eat. They only want to breed. Some males eat during breeding season, some don’t. This boy is an extreme example of one that doesn’t. It serves as a harsh contrast to other animals that continue to eat well all year long, even when breeding. I was always careful to closely monitor this guy during the breeding season. I offered him food but he never took it and he lost weight as the season went along. For the most part I always assure people that their snake will eventually eat but breeding males are a special exception to this statement. With a ball python male, it is possible to ‘breed your snake to death’. If you have a male ball python that won’t eat and loses a lot of weight during the season you many need to pull him out of the rotation earlier than you would otherwise like in order to keep him from losing too much body mass and passing a point from which he cannot return. One October I sold a 600-700 gram lesser black pewter with a voracious appetite to a customer out west. A few weeks later he emailed asking what I was feeding the snake as it would not eat. I asked him to send a picture of the enclosure along with a description of his feeding process. The picture he sent back was the snake in an empty bathtub with what appeared to be a 200-250 gram rat. While you could feed a Burmese python this way you stand little to no chance of meeting success when offering ball pythons food in such a manner. Finally, after several months without a meal, he took the snake to a friends house to see if it would eat there. It ate 20 minutes later. Shown below is a picture of the snake, taken less than a week before I shipped it out. Experienced ball python keepers will readily recognize her as a well fed animal. Ball pythons do not look like this unless they are healthy and feeding very well. So why did such an amazing animal stop feeding for so long? #10 Why (The Lesser Black Pewter) – Enclosure size and food size. Placing a ball python in an enclosure with as much open surface area as a bathtub is tantamount to setting them in the middle of an open field with large birds of prey circling above. She will feel exposed, vulnerable and very uneasy. Combine this with the fact that the rodent was way too big for her and you’ve got the perfect anti-rodent swallowing recipe. I traded emails with my customer on many of the items listed above and he continued to report a feeding hiatus. There was something in the environment that the snake did not like and whatever it was, it created a feeling of insecurity that prevented her from having the necessary confidence to feed. I cannot say what it was but the fact that the snake ate only a few short minutes after being set up in a new environment is strong evidence in support of a subtle (snake-specific) husbandry issue. This also illustrates a very difficult point of contention between seller and buyer. Ethical breeders only sell snakes that are healthy and feeding well. I don’t sell snake that are not feeding but that does not mean the snake will continue to feed the same way when it is in the hands of a new keeper (even an experienced one). This is part of ball python keeping; it comes with the territory and is one of the risks inherent in the business. Assuming that you can trust the seller’s word on the feeding behavior of the snake (which is supported by the physical appearance of the snake when it arrives) it is ultimately up to the buyer to figure out how to get the snake to feed. The seller can offer advice and insight but little else. And that is not always a point of consensus. Ball pythons are crepuscular terrestrial animals. In the wild they are often found hiding in animal burrows and termite mounds. They like the safety and security of small spaces. Accommodation selection in the wild provides us with valuable insight into how they prefer to live. We are wise to pay attention. If you have ever had a ball python get out of its enclosure you probably found it jammed into a tight little crevice somewhere in your house; it probably wasn’t lounging in the middle of the room. Being crepescular by nature ball pythons tend to avoid being out in the brightly-lit open whenever possible. When set up in enclosures that are clear, translucent or simply too big they do not feel safe. Humans and ball pythons do not share the same definition of safe. Ball pythons typically feel safe in small quarters …very small quarters. A person, unaware of the conditions in which a ball python will thrive, might look at such accommodations as mean or inhuman when, in reality, they are perfect for the snake. Webster’s dictionary defines inhuman as “not human in nature or character” and that is exactly what ball pythons need: to not be treated as human. Humane? Yes. Human? No. 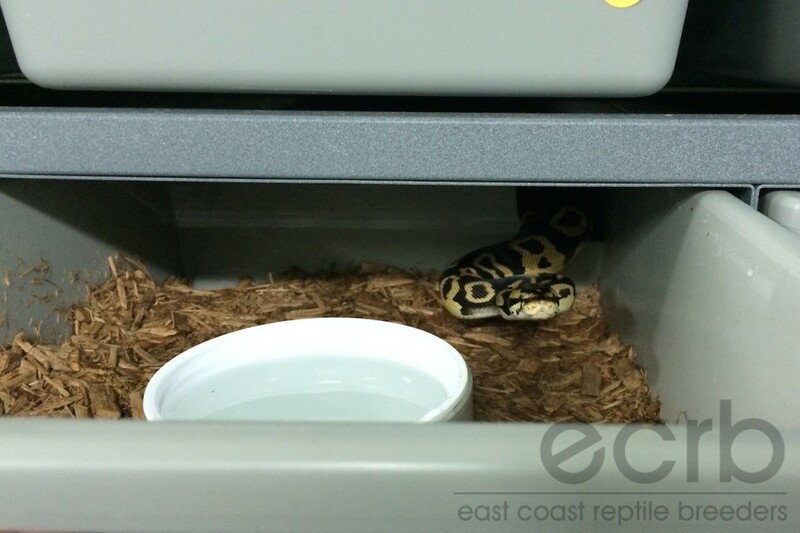 Why does a ball python that gets loose in the house find a dark, cramped place to hide? Why do ball pythons in the wild jam themselves into deep recesses in a termite mound? Simple. They like it. They feel safe. And the only way a ball python is going to eat is if it feels safe. This means that most people are keeping their snakes in enclosures that are completely wrong for the snake. As a result, the snake feels vulnerable and afraid. The lack of facial expression or other mechanisms of communication make this fear very difficult to convey. You have to look for the other signs (like not feeding). Because the act of constricting and swallowing prey is a very vulnerable thing for a snake to do they must feel that they are safe in order to do it. If they don’t, they aren’t going to eat. Unfortunately, snakes have no physical capacity to show us they are uncomfortable. A balled up snake that is afraid looks like every other balled up snake. No panting, sweating or relentless back and forth glances are ever going to come from your ball python. If it’s afraid, it will just sit there and be afraid; and it certainly won’t eat. The dreaded “1,000 Gram Wall” is the bane of a ball pythons breeder’s existence. By far the most notorious time for a hunger strike to hit is when a ball python is in the 1,000 gram range. It is particularly annoying with female ball pythons because most breeders will give serious consideration to trying to breed females in the 1,300-1,500 gram range and a strong feeding ball python can put on the remaining 300-500 grams of weight in a few short months. Your snake may be ravenous from day one, racing up to near-breeder size in a year. You begin to excitedly contemplate what you are going to pair her with only to find that she shuts down for several months somewhere near the 1 kilo mark. The stoppage in feeding, which you are unable to overcome, causes her to miss the season, setting your pairings and your profits back by a full year. It is a story told a thousand times each season and it is painful to endure. Since you only have one shot per year to gets eggs from your girl it is very frustrating to have everything seemingly on track and get derailed at the last minute by a hunger strike. I do not have a magical formula for dealing with the 1,000-gram wall. I, like most keepers, suffer it rather than overcome it. I keep trying different things but the only real fix I have for the Wall is patience. I have been doing this long enough to know that if I have the environment right they will eventually start to feed again. I just need to keep offering food. Patience plus persistence are my best bets when dealing with the Wall. Wrong type of food (rodent size) – Every ball python has its limits on how big (or small) a prey item can be. Big adult females, for instance, will often kill jumbo rats but they won’t swallow them. They do much better with medium rats. They “size” them up quickly and decide whether or not they can take them. And some are more confident than others. Trial and error will teach you what size prey your snake will accept. Wrong type of food (live vs. frozen/thawed) – Ball pythons that are fed live food (like all of mine) do well with live food (duh!). How long it will take them to switch to frozen/thawed is highly random. Some switch right away, some may take months. I always tell people the same thing: keep offering f/t but be prepared to offer an occasional live rodent during the process. If you are patient, they will almost always switch. But how long that will take is a question I cannot answer. The enclosure is too big. – This is a central theme of this article. Large enclosures are bad for ball pythons. Yes, there are plenty of ball pythons that feed fine in large glass enclosures. But I consider them to be well-integrated exceptions to the natural behavior of a ball python. This article is not directed toward the hyper-confident ball python that feels safe in a large glass terrarium. The enclosure size just changed (usually because it just got bigger). The location on the rack just changed. (assuming you use rack systems) – It may sound odd but moving a snake to a different side of the room or a different location on the rack can sometimes kickstart their feeding. I suspect there is something I cannot detect in the snake’s perception of that particular location that causes them to feel unsafe. It could be the way the light comes into the tub, the shadows that are cast when I walk by or some other factor beyond my ken. By trying others ares in the room/facility you may be surprised to find a positive result. The snake doesn’t feel safe. The snake’s age/size. – See my discussion on the “1,000-gram Wall” earlier in the article. Weather. There is almost certainly a linkage between barometric pressure and ball python feeding and breeding activity. Experience keepers tend to agree that feeding (or breeding) when a storm is approaching is a recipe for sucess. I do not profess to know the mechanics of it but I have witnessed the results year after year. Insomuch as I can tell it is not based on superstition; it is a tangible reality that snakes are more aggressive feeders when a storm is approaching. If it’s storming, I’m feeding. Or, if it’s breeding season, I’m pairing when the storm is approaching. Time of year. Ball pythons don’t tend to feed as aggressively during breeding season. This is far from a safe statement, though. Some of my animals (male or female) feed just as well during the breeding season. But, as an example, the last time I offered my breeder males food (during the breeding season) only one ate. Freshness of bedding. – I have found that ball pythons often don’t feed well when their bedding is ‘old’. Some snakes are great feeders in fresh bedding but are reluctant to feed as their bedding ages. Justin Kobylka wrote an article a few months ago on ball python feeding in which he suggests that feeding behavior can be linked to urates/feces in the tub. Justin believes that remnants of the snakes own waste can cause a feeding hiatus. My observations about the freshness of bedding may be in support of this because I often change both the tub and the bedding at the same time and experience better than normal feeding in the period of time that the bedding is ‘extra fresh’. You can and should read Justin’s article by clicking here. When variable #2 was changed we witnessed variable #1. But was it really variable #2 that caused variable #1 to be true? Or, was there another variable that went unnoticed that contributed to variable #1? Or was it a combination of variable #2 and the unnoticed variable #3? The possibility (and probably reality) that no one thing causes a ball python to start/stop feeding means that the question remains open to further study. I do not have the answers. What I do have is years and years of casual observation under my belt that lead me to believe that my assertions are credible. But I concede that they are still open to further observation and learning. Justin’s hypothesis about a snake’s own waste playing a role in feeding is an excellent example of the need to apply continuous analysis to the feeding behavior of ball pythons. I have long believed that fresh bedding was the factor that lead to improved feeding response. But now I’m open to the possibility that the freshness of the bedding may be either incidental or secondary to the lack of scent of the animals own waste. I’m not convinced, mind you. Ball pythons eat all the time with waste in the tub. I never considered it as a possibility, meaning I never considered it as a variable. I’m not sure if it is right or wrong but I respect Justin’s observation and will look for ways to explore their validity.